Cycling is a great way to stay physically active. Biking is a carbon-free means of commuting and getting out of soul-sucking traffic. Slowing down and riding a bike lets you see things you would otherwise miss locked inside a speeding car. But the best reason to ride a bike is that it's fun. And we need more fun. The garage is fertile ground for creative minds, be they musicians, engineers or artists. John Fitzgerald's garage is no exception. In the back of his St. Rose neighborhood home in Santa Rosa, amid the washer and dryer and tidy storage boxes, Fitzgerald builds beautiful steel bicycle frames for a devoted clientele under the Fitz Cyclez (fitzcyclez.com) brand. The dirt trails and winding roads of the North Bay have long been a draw for cyclists and frame builders. The list of North Bay bike builders is long and storied: Joe Breeze (Breezer), Scot Nicol (Ibis), Ross Shafer (Salsa), Josh Ray (Soulcraft). Great riding attracts great frame builders. But it was affordable housing, not cycling, that drew Fitzgerald and his family to relocate to Santa Rosa from San Francisco one year ago. The cycling scene was a bonus. "The roads here are perfect for it," says Fitzgerald, who has been building bikes for 10 years. Fitzgerald, 43, a lanky man with glasses and a long goatee, began working on bikes during his time with AmeriCorps in Austin, Texas, as part of the Yellow Bike Project, a nonprofit bicycle-advocacy group. He went on to apprentice in frame building for Rock Lobster in Santa Cruz and Banjo Cycles in Madison, Wis., before setting out on his own almost four years ago. Fitzgerald specializes in road and randonneur bikes. Randonneur bikes are built for all-weather, day-and-night, long distance rides. As such, the bikes have fenders, light systems and smalls racks for holding food and gear during self-supported rides. "It's a niche market that the big guys aren't tapping into," Fitzgerald says. 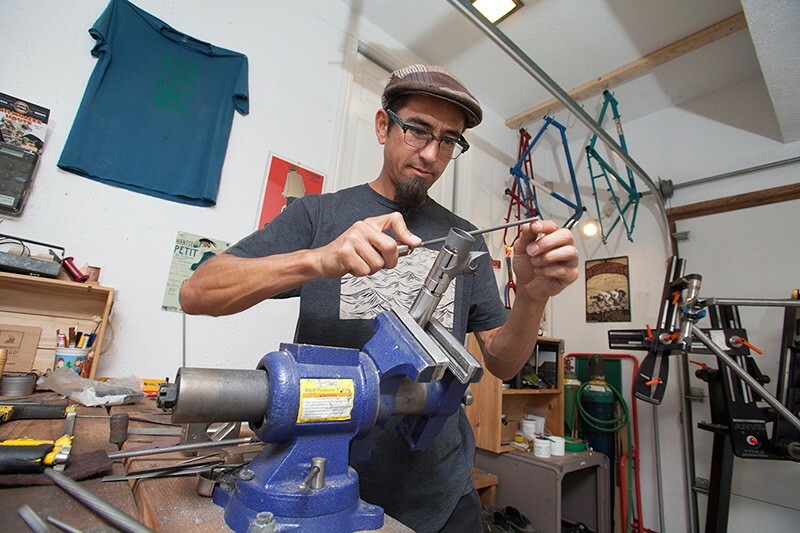 GARAGE DAYS Custom frame builder John Fitzgerald relocated Fitz Cyclez from San Francisco to Santa Rosa one year ago. Randonneuring began in France as an alternative to competitive cycling. Randonneuring is not about racing, but getting from A to B and enjoying the ride and the company of fellow cyclists along the way. In events called brevets, riders must complete a course with stops at checkpoints along the way in set times, no earlier and no later. While carbon fiber and full suspension bikes are all the rage, steel is Fitzgerald's material of choice. It's the material he knows best, and it appeals to his old-school aesthetic. He's drawn to the lines and details of French-made bikes from the 1950s and '60s, and he works in some of the style and design elements from that era into his frames. "I've always had an affinity for older things," he says. He built himself a sharp-looking, single-speed mountain bike with a retro rigid fork, and delights in keeping up with riders on bikes tricked out with full suspension and other modern components. Fitzgerald's wife, Sandra, is a psychology professor at San Francisco State University. He's a stay-at-home dad who builds bikes in between school drop-offs, pick-ups and baseball practice. For his sons Mateo, seven, and Eisen, 10, he built a "side-hack," basically a bike with a sidecar. He gets plenty of smiles when the three of them roll around town. Custom bikes can cost as much or less than a store-bought bike. If you're particularly tall or short, having a bike built to your measurements makes for a much more comfortable ride. And if you want something you don't see on the market, like a rando bike, a custom build can be the way to go. His frame and fork sets start at $1,275. Jens Voigt may have retired from pro cycling, but he's still riding hard on the heels behind Levi Leipheimer. This year, the German cyclist lends his nickname to the inaugural Jensie Gran Fondo of Marin on Oct. 10 (thejensiegranfondo.com), trailing Sonoma County's popular Levi's Gran Fondo by just one week. 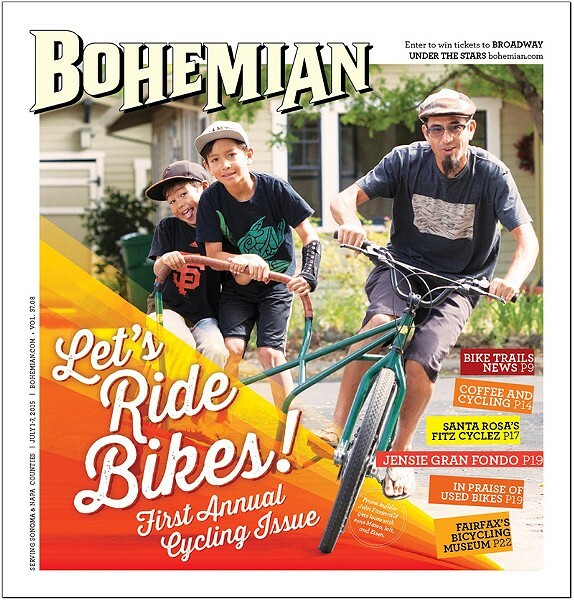 "It's going to be a great event," says Jim Elias, executive director of the Marin County Bicycle Coalition (MCBC). "It brings in one of the most iconic cycling personalities of our era." Voigt, a resident of Germany who announced his retirement in 2014, loves to ride in Marin, according to Elias. "He's also quite a personality and a lot of fun," Elias adds.